Skimpy outfit aside (I'm starting to get numb to them by now...or at least not so surprised anymore) this outfit throws away one major part of the character: her association with the Joker. Harley Quinn was a character who was indirectly created by the mind of the Joker. She dressed as, well, a harlequin to go along with the clown theme. Added to the mix was that she had a background in gymnastics, and basically her suit was a unitard. Makes sense, right? I've always been a stickler for a character's outfit being a representation of his or her motive or identity. Now what does the above costume represent? I really have no idea. It just looks like a cosplay outfit to me, reminiscent of the Arkham Asylum video game. So what kind of statement does that make? Her relationship to the Joker was such a complex and deliciously twisted one that I was sad to see it go. The Joker was her main source of motivation: she did anything to please him, much to hilarious or tragic results. Cutting her off from the Joker completely leaves her drifting in thin air as a nothing but an motive-less psycho in a skimpy outfit. Though she had broken ties from the Joker in Gotham City Sirens, he was still a looming shadow of her past that still held some sway over her psychologically. She was still motivated in some way by him, however tenuous. So what is it you're trying to say now, DC? I agree to an extent that the Joker should always at least be a shadow over Harley (I love the Karl Kesel run of Harley Quinn too much to say they should always be a double act). I think the reason writers and fans want to divorce the two is because Harley is so damn loveable people want her to have a happy ending, ditch the abusive boyfriend and flat-share with her girlfriends. Unfortunately, it does rather rob her of some of her essential self to do it. The more I see this outfit the more I am bothered by one other thing - what's with all the knives? Since when was Harley a slasher? 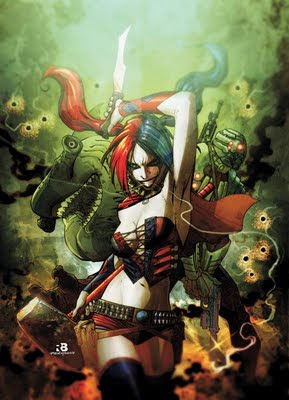 Ok, maybe, MAYBE I get where they are going with the knife thrower/circus act connection, but that doesn't have a damn thing to do with Harley Quinn! I get that the Joker uses knives, because they are scary. But Harley isn't trying to scare anyone ever. And knives just aren't funny. I can accept all of it as typical comic book propoganda/'progress' except the knives. Oh, and the lack of a domino mask. There is absolutely nothing on this cover that is pleasing. They've made the Shark look like a dinosaur, and they're messing with Deadshot too. Poor Harley. She looks demented, and not in her normal sort of way. She had a really rather perfect costume before, and now...this mess? Yeah, besides the skimpy outfit it really doesn't speak of who the character is. Something quite a few of the redesigns did was take away from either who the character is or what is recognizable about their costumes. I remember the words of a comic artist that said "if it's not broke don't fix it. Something a lot of artists should learn." Another railroad spike-size nail the coffin of the concept of comics being more mature, unless I was extremely mature when I was 15. Harley was a fun and creative character, has she now been officially "badassized"? Yuck. And I'm pretty sure they won't even buy/follow comics at the end of the day.. I can understand that, James. I guess they want a happy ending for her! But she is kind of a tragic character, so it doesn't quite fit. The knives!! I didn't even notice! Yes, that is just...it doesn't fit with her. Good point, Bubbashelby. And no mask! The mask is such an iconic part of her look. I didn't even notice Shark back there, either. Quite right, Erin. I really hate the new Booster outfit. It's just so....busy. It was so sleek before. Aaron, she definitely doesn't look fun at all anymore. She was whimsical and cute and nutty...she wasn't supposed to be a badass. I thought that we were past the 90's but I guess not? Eyz, I think you're right about the Arkham Asylum thing...it's seeped into the comics. And are fans of that game buying a ton of comics? Probably not.